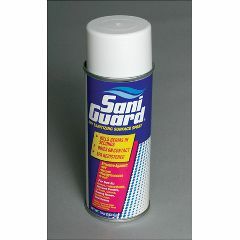 SaniGuard® is an EPA registered sanitizer that kills 99.9% of all germs, bacteria, and viruses on contact. Unlike other sanitizers, SaniGuard dries on contact – eliminating the need to wipe or wait for the surface to dry. This is the ONLY dry-on-contact sanitizer on the market that is completely safe; does not require the use of protective equipment, can be used on surfaces that come in contact with food (FDA CFR 178.101); and does not require potable water rinse. SaniGuard is a simple, cost-effective way to keep your medical facility, office, restroom, school, home, kitchen, or workstation germ-free in just minutes. SaniGuard® Sanitizing Spray is great for quick cleanups on "hot spots". Use it to sanitize phones, faxes, keyboards, hook and loop fasteners, fabrics, shared office equipment, light switches, faucets, toilet seats, door knobs, drinking fountains, keyboards and computer mice, athletic and exercise equipment, handrails, desks, and break room tables that are notorious harbors for germs and bacteria. Ideal for use where sprays can penetrate and wiping is not possible. Can even be used on paper. Available in a 10-oz. can. Has 24-month shelf-life. These antimicrobial cleansers are great for Ebola, MERS, Flu and other airborne virus protection. These antimicrobial cleansers block alpha particles and low-energy beta particles from entering your system. Ebola hemorrhagic fever is a severe and often deadly illness that can occur in the human body. Health organizations recommend to avoid areas in which there are epidemics. For full protection its ideal to wear a gown, gloves, and mask around sick patients. These precautions will greatly decrease the risk of transmission. I have a daycare. Can I use it in my home?